Microsoft Dynamics CRM Implementation — Automated Media, Inc.
Is your organization full of fast-moving sales, marketing and service leaders? Microsoft Dynamics CRM provides the tools to enhance sales, marketing and customer service processes and is designed to complement how and where your people work. Increase Sales Success – Streamline sales cycles and improve win rates with lead and opportunity management, automated lead routing, sales process management, competitor tracking and mobility options for your road warriors. Improve Qualification – Target efforts to the right leads and prospects, establish consistent follow-up processes and automate sales activities with powerful system workflows. Improve Customer Service - Create a centralized, customizable view of your customer information, interaction and service history, so that your service level never misses. 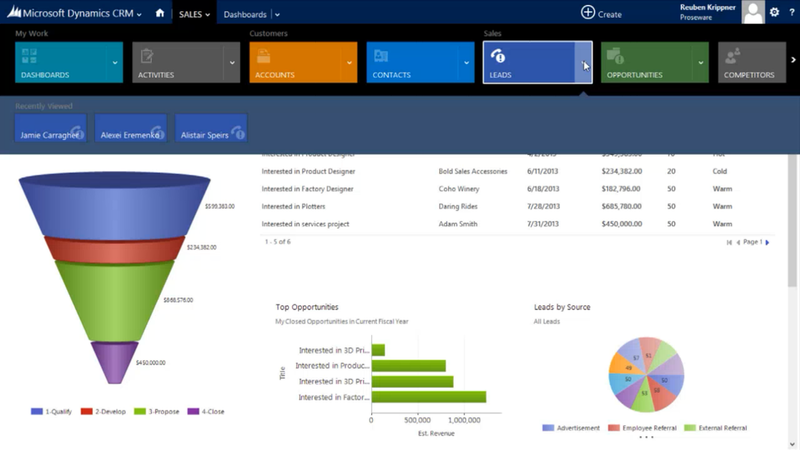 Tie Marketing to Sales and ROI – Microsoft Dynamics CRM offers a complete solution from campaign management, e-mail sends and lead capture, and allows your organization to manage to closed sale and customer service – providing greater power to focus on the best areas for return on investment. Manage Specialized Processes – Microsoft Dynamics CRM isn’t just a sales and marketing automation tool. It stands out in the marketplace as a platform that can help you manage any type of interaction and process, whether it be recruitment, a busy healthcare practice or a public call center. Provide Tools for the Way Your Team Works – Microsoft CRM includes three ready to go end-user experiences with each license or subscription. Access the solution via mobile unit, internet browser or inside of Microsoft Office Outlook. That means that however your team works, they can manage customer e-mail, appointments, tasks and contacts from a single, easy-to-understand business application. Microsoft Dynamics CRM Online – Powerful CRM software delivered as a public cloud service directly from Microsoft, providing instant-on anywhere access, predictable pay-as-you-go pricing and a financially backed service level agreement (SLA).On-Premise Microsoft Dynamics CRM - On-premise CRM implementation with unlimited customization and integration capabilities, most commonly chosen by companies with highly specialized requirements.Private Cloud (SaaS) Microsoft Dynamics CRM – This option combines the convenience of the cloud subscription model, with unlimited customization and integration capabilities that are associated with an on-premise deployment. With our 100% go-live rate and numerous Microsoft Dynamics CRM deployments both big and small, you don’t have to look any further to find the right partner to deploy and support your solution. AMI is a partner that remains committed way beyond the initial go-live. We provide training, support plans and a full schedule of customer events to ensure long-term success and satisfaction with your Microsoft Dynamics CRM solution.